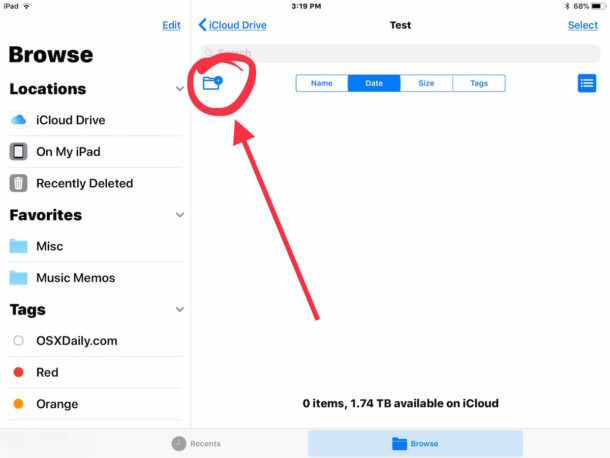 The Files app for iOS provides access to iCloud Drive and every file or folder contained within it, whether for individual apps or things you have uploaded yourself to iCloud Drive. 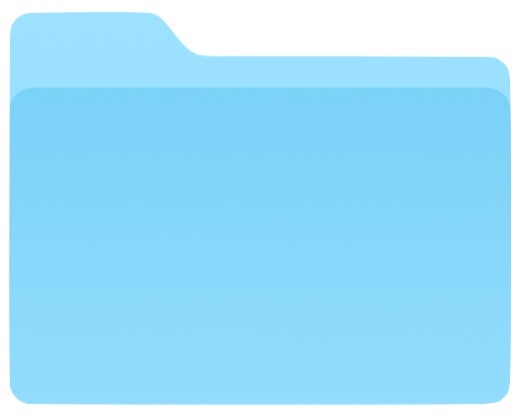 If you want to better organize your files in the iOS Files app, you can easily create new folders in Files app. The Files app on iOS behaves the same on iPhone and iPad, but it may look slightly different to accommodate the different screen sizes. For the demonstration screenshots here, we’re using an iPad, but the behavior to create a new folder in Files app is the same for an iPhone too. You can create as many new folders as you want this way. 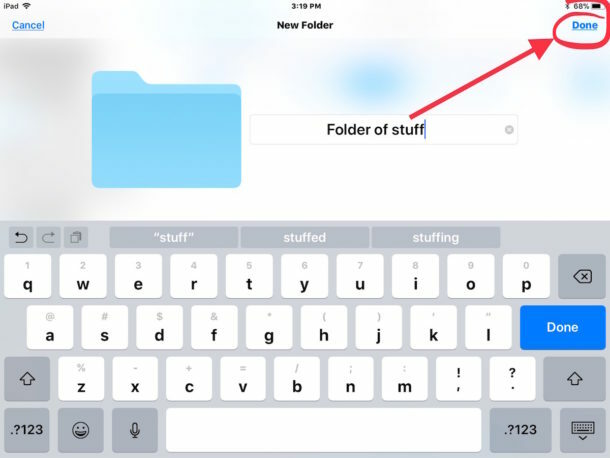 You may find this particularly useful if you want to create a folder for particular files, pictures, or data, and if it’s accessed frequently, then you can add the folder to the Favorites list in iOS Files app for quicker access. * You can only create new folders in the “iCloud Drive” section of Files app. Curiously, you can not create new folders directly to the “On My iPad” or “On My iPhone” location of Files app, nor can you drag and drop a new folder or file into the On My Device location of Files app. Instead, only apps in iOS can save files to those directories or create new folders in those local directories. That may change in a future version of iOS or a new version of Files app, however, who knows. For iOS users who sync a Bluetooth keyboard to iPad, or who use a Smart Keyboard on iPad Pro, you can create new folders in Files app with a simple keystroke too. If that new folder keystroke looks familiar, it’s probably because the same keystroke will create a new folder in the Finder of Mac OS too. Remember, the Files app only exists in iOS 11 or later, so if you don’t have the Files app it is because you are on an older version of system software. 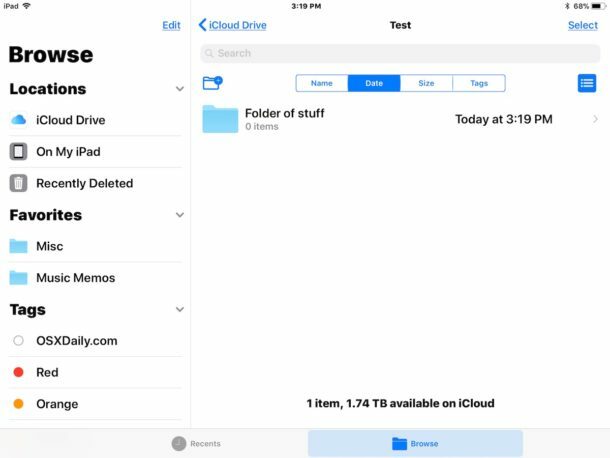 Previously, the Files app was called iCloud Drive, but now the Files app contains both iCloud Drive access and local file access to local items created by apps installed on the iPhone or iPad. Too bad we can’t create folders anywhere other than the icloud drive, as stated in the last paragraph. It makes the ‘on my ipad/iphone’ storage location pretty much useless. Especially considering that files uploaded to icloud drive are still stored locally on the device from which they were first uploaded. By the way, the paragraph about the limitation for creating folders is inaccurate. They forgot to mention that in addition to icloud drive, the files app also allows to create folders in any other location except for ‘on my ipad/iphone’. This includes 3rd party file managers such as Dropbox or Google drive that may be included in the list of available storage locations. On my iPhone there’s the Numbers folder from the Numbers app, and I can create new folders under it. So you could use it as a root folder for your file system. Bit of an ugly work around, and not sure if this is super useful. You are completely correct. It is beyond preposterous. I had Apple before there were fansboys and this iPad pro will be my last Apple device. I just get too angry every time they screw people over in these apparent ways. It’s about user experience. The entire iPad experience is terrible overall because of it. I bet a notepad half the price would have been more functional. I can’t count how many hours I have wasted on horse* like this. It’s not isolated, it permeates the experience. As to your concrete suggestion, yes can be done. Would have been my workaround, but it will not be because you can’t remane them. I think I will just use the numbers folder like someone else suggested then. I also find it amazing that none of these online resources seem to ever really critize some of this non-sense that has been happening with increasing force since Steve Job is no longer wit us. Still not wanting people to save locally but rather have to access via the net which is totally useless if you don’t have a cell signal or WiFi.Wish engineers could see past their codes and egos. Pls see my reply at the bottom to see if you can do it too. Hope you are able to make max use of your ipad. Thus making it utterly useless to me. Exactly. It’s a maddeningly obtuse functionality, makes me suspicious that they are pushing iCloud subscriptions. Whoever designed this and the photos app in iOS needs a lesson in user interface best practices 101. Remember, these are not our devices and computers anymore, apple proved this by this file system method and our computers not playing our own music (unless we reinstall the albums that iTunes cannot find). Adobe is worse, at times they will not let me use my CS4 unless I reboot my apple computer. They are worse then a communist regime! How many of you have tried the Workflow app? Apple apparently acquired this app and is integrating it into Siri and using it to add functionality to her. Depending on your skill level, you could possibly simplify this process within Workflow and make a repeatable shortcut. I’m trying my hand at making some custom Workflows to streamline file downloads with automatic organization. Save a little bit of time having to go into cloud services and rearranging the downloads into respective folders. I have a problem. I can’t bring “on my iphone” to file locations and use it. what should I do? Not being able to create folders “on my iPad” is both misleading and infuriating. One of the main reasons I purchased my iPad Pro (with maximum storage, mind you) was to have the ability to save files “in the field”, away from a WiFi connection. I film video from a drone, at very high resolution and frame rate, which creates extremely large files from 5 to 15GB. If I’m camping overnight at a location that I’m filming, having the ability to save, organize, and do rough edits to my footage is a major plus. Instead, we have this stupid iCloud hurdle. Even with a WiFi connection, uploading files in the size range is unnecessary and impractical. This needs to be fixed. Having to use a folder created by GarageBand is just sloppy and annoying. Have just been given my wife’s old iphone se when she had a new contract, but have decided to stick to android as it is so infuriating that you have so many restrictions in using the thing. You cannot access files if you do not have a wifi or wireless connection and cannot store files on the machine. What is all that memory for if it is unusable?! What do they think that we use these devices for, not just for listening to music or playing games! First check if your ipad got an apps called Pages. Should be pre-installed. Goto Apps Store to ensure it is updated. Then, goto Photo apps. Select any 1 photo. Click share button on top right corner. Then click Save File. Then, on left side, select ‘On My ipad’ instead of iCloud. Then on right side, save this pic into ‘Page’ folder. After that, goto File App > On My ipad and there is a new ‘Pages’ folder. You can now create any new folders insider this Page folder and any sub-folders to best organises your files. Clicking mp4 for example it will open up with stock Movie apps by default. I hope everyone of you are able to do what you want. Any further help needed please share here and I will try to see if I can help. I find this to be indicative of the big three – Apple, Google and Facebook telling us once again how we can do things. The fact we cant create our own files on our Ipad because we dont want it on icloud should not have been prohibited of this functionality by apple. I am starting to get very tired of apples bullying approach to how we can use technology with our products. I may be only one voice, but eventually voices start to add together and it becomes a movement. Apple you may be serving your shareholders well but as your buying clients we are tired of these shenanigans. It must come to a stop. Quick test on iPhone iOS 12 – needed to download Pages to get this to work. Following these steps created file ok. But subsequently deleting Pages app also deletes the new Pages folder in Files / On My iPhone. A little app that created a ‘Root’ folder in Files would be handy. Inadvertently, the small PTV app by Public Transport Victoria (Melbourne) also creates a Folder, that you could utilise as a ‘root’ directory.